The nation continued to bask in the warm weather and sunshine over the weekend but will it continue throughout the coming days? 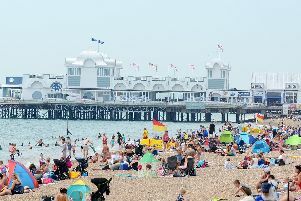 The current forecast for Portsmouth and the surrounding region, according to the Met Office, is for the glorious weather to carry on for the rest of the week. Today is expected to be the warmest day of the week, with highs of 28C predicted for across Hampshire. But it will continue to remain warm, with temperatures staying between the low and mid 20s with a mixture of wall to wall sunshine and sunny intervals being forecast. Portsmouth Water and Southern Water are advising customers to save water as the heatwave continues, including taking short showers instead of baths, letting your lawn go brown and steaming vegitables instead of boiling them.